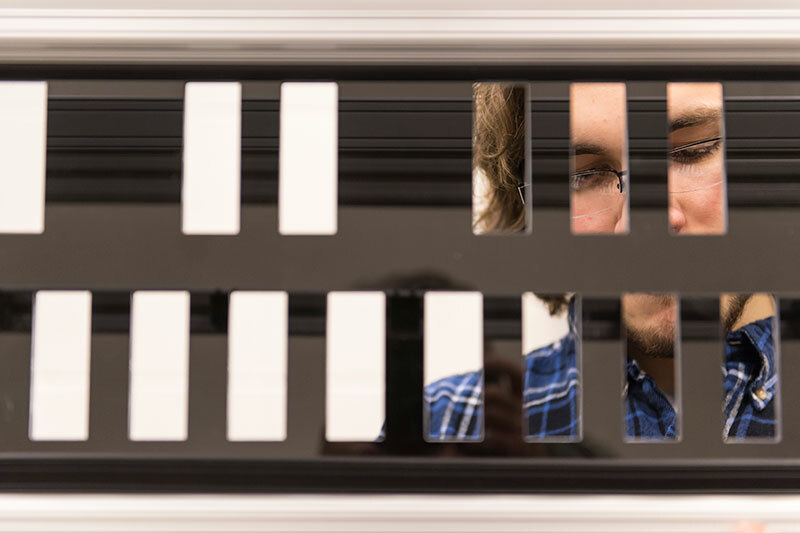 It’s not necessary to have a physics student on hand when assembling a digital practice carillon—straight out of the box—but it doesn’t hurt. 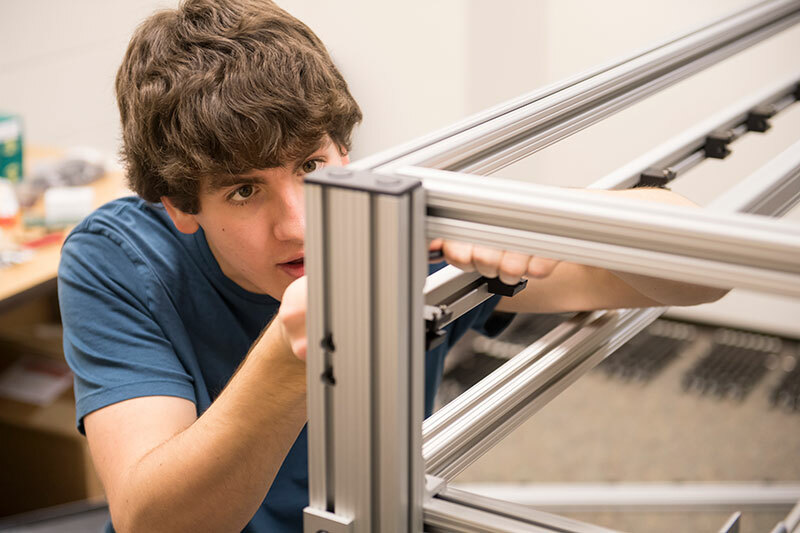 Alex Johnson ’19, a physics and math major at the University of Rochester, recently led a team of his fellow classmates in putting together the College music department’s new practice instrument. The “real” carillon—the historic Hopeman Memorial Carillon, a musical instrument of 50 hand-cast bronze bells—is housed in the tower of Rush Rhees Library. Its chimes, every quarter hour, are familiar sounds across the University community, as are regular carillon concerts, performed by students. Johnson, a Texas native, is among those students. He first became interested in playing the carillon while still in high school. On a visit to the University, he heard his campus tour guide announce that the carillon was played by Rochester students. “The guide said, ‘Oh, you can play the bells,’ and I was like, ‘Wait! What?” says Johnson. But the carillon is a difficult instrument to play, and students are often ambitious about what they want to perform. Doris Aman, music department instructor and coordinator of the Carillon Society, recalls that after one student heard the Queen classic Bohemian Rhapsody while on a tour of the campus, that student wanted to do it, too. “That particular piece is challenging to play on the carillon,” Aman says. Johnson says his prior musical experience gave him an edge in learning to play the carillon, but that it takes a lot of practice to get to a level of playing enjoyable repertoire. “You have to be motivated to put in the work, but it’s really worth it,” says Johnson, who is also a member of the Mbira and Gamelan ensembles at the Eastman School of Music. And now, to build it. 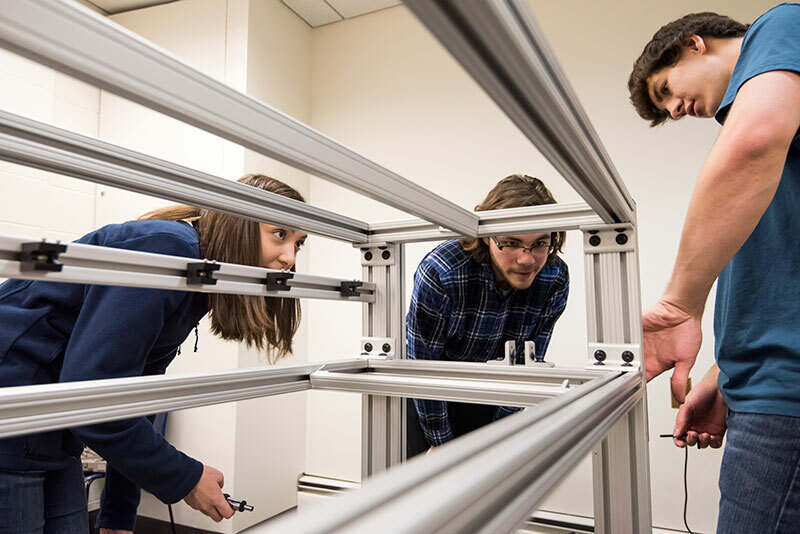 Building the practice carillon can help students develop a deeper understanding of the instrument, says Jimmy Warlick, manager of musical performances and programs for the Department of Music. “It’s an opportunity to learn as well as being a collaboration project, from start to finish,” he says. A group of seven students, led by Johnson, began building the digital carillon just before the winter break. They pulled together the manufacturer’s guide, instruction manuals from the box, as well as instructional videos online to complete the formidable task. The new practice carillon has a standard MIDI output and can connect to any MIDI keyboard to produce any prerecorded sounds. An added benefit of the technology is that players can now hear actual pre-recorded audio samples of the University’s own carillon while practicing on the keyboard.